The first fighter aircraft with a turbojet powered, produced under license in Poland. In March 1947 the new requirements of the Air Force CCCP were presented. Speed at high altitude, strong weaponry, flight duration of about one hour. A new engine was needed to meet these requirements. Series RD-10 and RD-20 turbine engines manufactured in series would not be able to drive new constructions. Unfortunately, in CCCP relevant engines in early 1947. there was no. The CCCP tested turbojet engines with high thrust, but it was far from mass production. At that time, a delegation was sent to Great Britain, a country that was the leader in turbojet engines. It was composed of: Mikojan, Klimow - engine builder, Kiszkin - technologist. Not much was expected. The relations of the recent allies have cooled. However, the British wanted to sell engines. The result of the CCCP-UK talks was the purchase of a production license and dozens of two different types of engines. The first one was Rolls Royce Derwent 5 with a bandwidth of 15.6 kN. 30 pieces were bought and RD-500 was marked in production. (500 is the number of the factory). The second Rolls Royce Nene 1 and 2 at 22.3 kN. 25 items were bought, and RD-45 was marked in production. (45 is also the number of the factory). It should be recalled that the purchased engines were used at the time in the aviation of several countries. They weren’t secret constructions. Mikojan chose a stronger engine for his future fighter, but it was heavier. The selection of the concept of the future plane lasted for a long time. Mikojan wanted to avoid the troubles that accompanied the MiG-9 fighter. He didn’t use the two-engine system. He resigned from the outlet nozzle under the fuselage, considering it to be non-prospective. For a long time he maintained a concept similar to the English Vampir, but with a slanted wing. As for the wings, he had no doubts. They were to be slanted. A plane was to have a top speed of 1,000 kilometres per hour (620 mph) and a range of 1,200 kilometres (750 mi). These requirements were very difficult to meet. This is how the I-310 project, i.e. the future MiG-15, was made. Interestingly, this wasn’t the last project. All designs were built in the form of wooden models and were blown in a wind tunnel. The results were analyzed thoroughly. I-310 had a serious disadvantage. It wasn’t very clear where to place the main chassis. The wing was too thin. The constructors decided to put the wheels in the thickened connections of the wing with the fuselage. This solution weakened the fastening of the wings. Many treatments have been made to obtain the proper stiffness of the wing. They were subjected to strength tests. First, the wing was too stiff and therefore too heavy. After the reconstruction, it lost 180 kg. Then the girder broke at 70% of the planned load. 18 kg of construction was added and a satisfactory result was obtained. Ławoczkin had similar problems. He, however, found a different solution. At the end of 1947, the I-310 was subsidized for the first flight. Wiktor Juganowa was chosen as the experimental pilot. On December 30, 1947, the first flight was made. Already in the middle of March 1948, before the state trials, the decision was made to start series production I-310 under the name MiG-15. On May 10, 1948, the date of transferring the airplane to state tests was set. The deadline was not met. The first of the two MiG-15 aircraft, the initial series, marked S-02, was delivered on May 27, 1948, and the second, S-01 - on July 5, 1948. Aircraft S-01 and S-02 differed significantly from I-310 flown by Wiktor Juganowa. The outlet nozzle has been shortened due to losses on the draft. the nozzle was hidden in the fuselage. The horizontal height and the ailerons have a larger slant. A few other changes have been made. As we know, other construction offices also worked hard, but were delayed in their work in relation to OKB Mikojan. Jakovlev with Jak-30 aircraft was the most delayed. The most dangerous was the Ła-15 airplane, with OKB Ławoczkina. State tests and more than one hundred comparative flights did not show the superiority of one fighter over the other. Both planes were produced in parallel. Only information from combat units allowed to assess the MiG-15 higher. Exactly a year after the first I-310 flight, on December 30, 1948, the first serial aircraft took off. The pilot was Wiktor Juganow. The hunters came to combat units at the beginning of 1949. Numerous modifications have been introduced in subsequent production series. Engine control automation, hydraulic amplifiers, and manual hydropneumatic brakes were changed to hydraulic. Very quickly, the RD-45 engine was replaced with a better RD-45 F. Water injection tests were carried out on the engine. In air combat units, airplanes flying at maximum speed were experiencing difficulties in piloting. As it turned out, it was the result of inaccuracies in the execution of the wings. Uncertainties in relation to the plans, reaching even up to 4 mm have been disclosed. Therefore, the allowable speed Ma-0.92 is limited to Ma-0.88. The MiG-15 was one of the first successful jet fighters to incorporate swept wings to achieve high transonic speeds. The MiG-15 is believed to have been one of the most produced jet aircraft; in excess of 12,000 were manufactured. The contract for the supply of Jak-23 fighters hasn’t been completed yet, and in July 1951, MiG-15 fighters began to be delivered. The reason was the development of events during the Korean War. The threat of the outbreak of World War III was very real. The MiG-15 aircraft proved itself in warfare and technically surpassed the Jak-23 plane. The first Polish combat units armed with MiG-15 planes. 5 DLM - 1 PLM, 13 PLM, 31 PLM 1951. 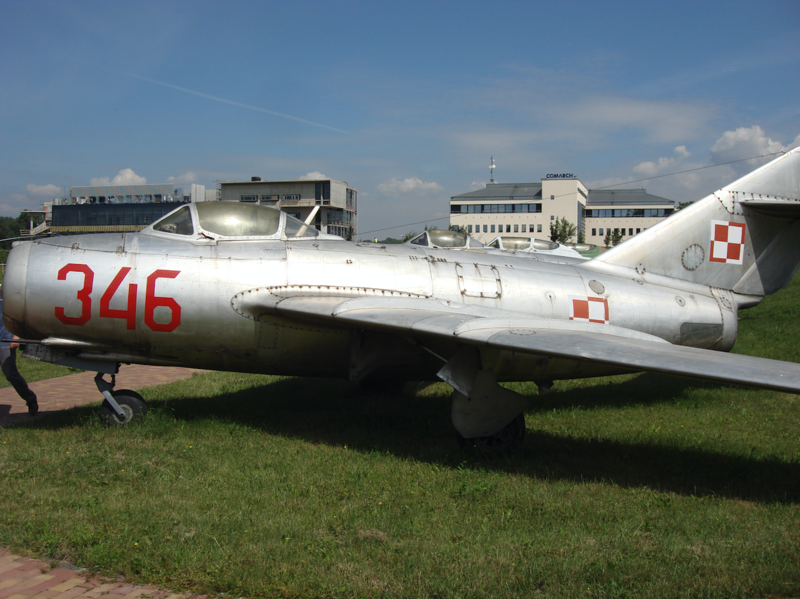 At the time when the 1st PLM in Warsaw's Bemowo was preparing for the first parade on July 22, during which Jak-23 fighters were to be demonstrated for the first time, on July 19, 1951, the latest MiG-15 fighters landed. It was 5 machines that were brought by a Soviet pilots based on one of the airports next to Berlin. The aircraft brought in had numbers; 0227, 0231, 0234, 0236, 0249 and were produced in 1949. Soon, the first 4 training MiG-15 UTI arrived at the airport in Bemowo. They came to Poland probably on July 30, 1951, and their numbers are; 104-11, 104-23, 104-24, 104-24. 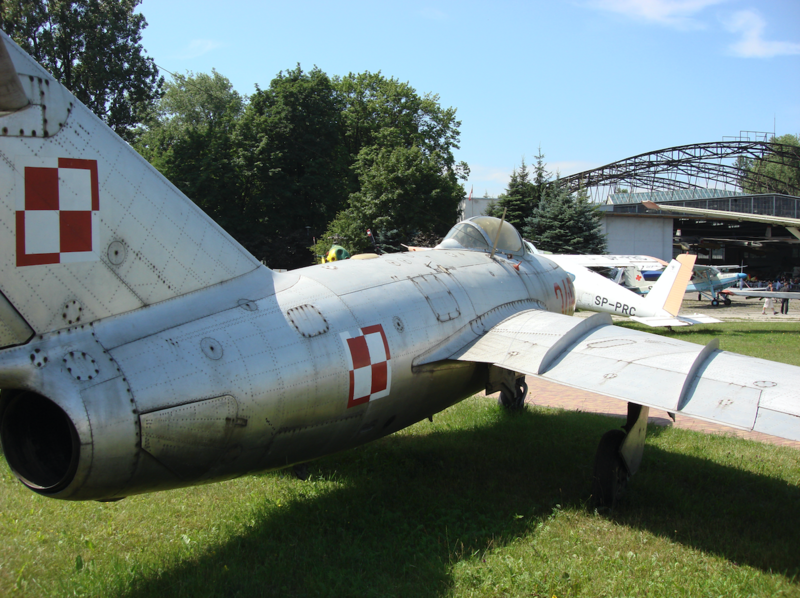 According to the decision of the 5th DLM command, the 1st PLM was to take over all MiG-15 fighters delivered to Poland. On November 1, 1951 in stock 1st PLM there were already 30 MiG-15 fighters. MiG-15 planes also began to receive 13. PLM, which temporarily had Jak-23 fighters. In December 1951. 5. DLM having 1. PLM and 13. PLM was already equipped with 60 MiG-15 and 4 MiG-15 UTI, which were distributed proportionally between the two regiments. 9. DLM - 29. PLM, 41. PLM, 26. PLM 1952. The beginning of 1952 was the period of formation of new air units, in accordance with the order of the Ministry of National Defense No. 00020 / org of December 11, 1951, and four divisions were planned to be created, each with three regiments. They were given a designation and location; 6. DLM - Wrocław, 9. DLM - Malbork, 10. DLM - Słupsk, 11. DLM - Świdwin. According to this plan at the beginning of 1952, 29th PLM began to be organized with the location in Malbork, and ultimately at nearby Orneta. In order to efficiently implement the plans on the basis of 13. PLM, a temporary training center was created. The last 25 Jak-23 planes from Warsaw received the regiment for training (approximately 64 Jak-23 was already in Kraków-Czyżyny), and 2 MiG-15 UTI No. 104-24 / 24, 104-25 / 25. The commander of the 29th PLM was named soviet Major Michał Bajczyk. On the deputy for piloting - Major pilot Stefan Łazarz, navigator of the Regiment, Capt. pilot Uglik. The commanders of the two squadrons were; 1 - Capt. Piotrowski, 2 - Capt. Buczyński. The training was very intensive, since at the turn of April - May 1952 the regiment was being relayed to the Malbork Airport in Królewie. When the 9. DLM was formed, had in its composition: 29. PLM, 41 PLM and 26 PLM. The last two regiments didn’t have airplanes. It was decided that 26. PLM will receive several Jak-23 from 29th PLM, and 41th PLM will receive several MiG-15 aircraft from 5th DLM. In this way, up to 26. PLM received 11 Jak-23 aircraft. The remaining 14 Jak-23 planes were detained in the 29th PLM. In turn, 41st PLM received in May 1952 14 MiG-15 aircraft from three regiments: 5. DLM: 1. PLM transferred 3 MiG-15 aircraft, 13. PLM transferred 5 MiG-15 aircraft, 31. PLM transferred 6 MiG-15 aircraft. 26. PLM was formed on the orders of the Minister of National Defense of the Marshal of Poland sowiet Konstanty Rokosowski of 23 March 1952 and placed in Malbork. The first commander was Major Iwan Gołubickij, and the deputy was Sobańko. On April 29, 1952, the first 9 pilots arrived from Radom and Dęblin. The first aircraft was 12 Jak-23, which was delivered on May 24, 1952. The first flights were made on June 2, 1952. In September 1953, the move of 26. PLM regiment to the newly built base in Zegrze Pomorskie begins. On October 31, 1953, the regiment receives 13 MiG-15 aircraft. The Soviets decided to reinforce the "allied" armies. However, the CCCP industry was not able to build a sufficiently large number of fighters. They had to take the risk and pass on the licenses of the newest and best of their fighters. In Poland, preparations for the construction of fighters were stopped: Jak-17 (G-1), Jak-23 (G-3) and RD-10 engines (G-2). On the basis of the resolution of the Polish Government of 19 June 1951 No. 12, it was decided to implement a plan to purchase a license for the production of the MiG-15 fighter. The former COP (central industrial district) was chosen as the place of production, and in it Mielec, Świdnik and Rzeszów. It was based on the traditions of the inter-war aviation industry of the Lublin region, derived from the former Lublin Aircraft Factory and Podlasie Aircraft Factory. The plant at Okęcie and several smaller auxiliary production plants have also been expanded. In Świdnik, during the Second World War, the airport and school were used by Germans. In 1944, the Germans destroyed everything. Therefore, the construction of the plant had to be led from the beginning. Design work began in the first half of 1949. These works were carried out by the Investment and Reconstruction Department of the Communication Equipment Factory - Warsaw Okęcie. At that time, it was the main investor in the reconstruction and extension of the domestic aviation industry. Technical documentation was prepared by Biuro Projektowania Zakładów Przemysłowych "Prozamet" in Gliwice in 1949. In 1950, the following offices joined the work: Department of Building Mechanics at the Gdańsk and Poznań University of Technology, Warsaw Office of Industrial Construction Design. The new factory received the name - Plant No. 5 in Świdnik. On January 1, 1951, the Central Board of the Transport Equipment Industry in Warsaw, based on the Resolution of the Council of Ministers, Ordinance of the Minister of Heavy Industry, dated 14 December 1950, established the WSK No. 5 in Świdnik (Zakład WSK Nr 5 w Świdniku). The greatest amount of construction work took place in the years 1950-1953. The first production halls were built in the years 1950-1952, with construction elements brought from Krzesiny near Poznań. In 1953, basic production and service facilities were put into operation. In 1951, the factory was given the task of launching the production of a metal MiG-15 fighter aircraft, under a Soviet license, with a turbojet engine. Over the period of 10 years, the Polish industry has built more fighter aircraft than the French famous Mirage aircraft for 20 years. The main factory producing new fighters became WSK Mielec, and subcontractor WSK Świdnik, although in the initial plans both plants were to be equal. The Soviets provided Poland with a license of a serial MiG-15 fighter, powered by an RD-45 F engine. Preparations for serial production began in the summer of 1951. The plane received the Polish name Lim-1 (license fighter - first). At the same time, in Rzeszów, the production of the RD-45 F engine was started with 1 x 22.25 kN (1 x 2,270 kG) under the designation Lis-1 (license engine - first). After submitting the MiG-15 license documentation, which included: complete construction drawings, detailed technological processes, drawings of instrumentation and tools, technical conditions, standards and other auxiliary processes, they began to translate these materials and adapt to Polish conditions. At the same time, the same production was launched at WSK Mielec, where translations and training of WSK Świdnik employees were also carried out. At the end of 1952, the Central Board of the Communication Equipment Industry made major changes to the production structure of WSK Świdnik. It was decided that WSK Świdnik from the final plant would become a cooperator of WSK Mielec, performing only: wings, ballast, engine bed, armrest and pilot's seat. In 1952, the first wings and tail were produced, which were transferred to WSK Mielec, where the assembly of these aircraft took place. In 1953, the execution of the rear part of the fuselage was also started in WSK Świdnik. The first produced copy of Lim-1 No. 1A 01-001 was assembled from parts produced in CCCP, as part of employee training. His first flight took place on July 17, 1952, at the aerodrome airport in WSK Mielec, and the pilot was Major Eugeniusz Pniewski. It was planned to show the first Lim-1 aircraft during the Communist holiday on July 22. However, then the demonstration of this aircraft didn’t take place. In order to make the first flight of a new plane, one had to ask the command of the air force to use a pilot with a license to fly jet-powered aircraft. At that time, none of the civilian pilots at WSK Mielec had such rights. On July 17, 1952, in the early morning at the airport in WSK Mielec, a Li-2 transport landed on which a military delegation arrived. It was led by WL commander, Lieutenant General Ivan Turkiel. He was present in the line-up; General Torochow - chief engineer of the air forces, and major pilot Eugeniusz Pniewski assigned to the flight. The plane was prepared for the flight in front of the hangar. A thorough inspection of the machine was carried out, asking many questions of technical service. Then Major Pniewski took a seat in the cabin. The rest of the delegation went to the command post, which was located in a special truck equipped with means of VHF communication. There was also an emergency team and ambulance with a doctor. The course of the flight was directed by General Turkiel himself. The commands were coded: 01-start the engine, 02-taxi for the start, 03-start, etc. The plane was taxing at the end of the runway and stopped. From the SD (command post) there were about 40 meters. The pilot made a test of the engine and took off after the command. At the end of the runway he rose into the air. The pilot has hidden the chassis and the flaps. He made a few gentle turns, climbs and falls, all the time remaining within sight of the earth. After a while the pilot asked for permission to fly over the runway at high speed. After obtaining approval, the machine flew at a height of about 50 m with a minimum speed of 800 km / h. This flight at the meeting made a big impression. They were proud that after years Poland has once again belonged to a small group of fighter aircraft manufacturers. After about 20 minutes the plane probably landed. However, General Turkiel didn’t agree to the participation of this single Lim-1 aircraft in a parade over Warsaw. The first series consisting of 6 aircraft with serial numbers from 1A 01-001 to 1A 01-006 was assembled from the imported parts. These aircrafts were handed over to the army in September 1952. Subsequent planes began to be sent to combat units from January 1953. The production of Lim-1 fighters in WSK Mielec ended on August 31, 1954, after being built in 12 series, 237 copies. The production pace was impressive. In the peak period, over 15 machines were produced during the month, and the record month closed with 20 machines. Lim-1 production in Poland should include about 60 machines delivered by CCCP, of which not all were new machines and 60 S-102 machines produced under license in Czechoslovakia. Together, Poland had 357 pieces of MiG-15 / Lim-1 / S-102 fighters. In the face of such a large number of manufactured single-seater fighters, one could feel the lack of school versions. 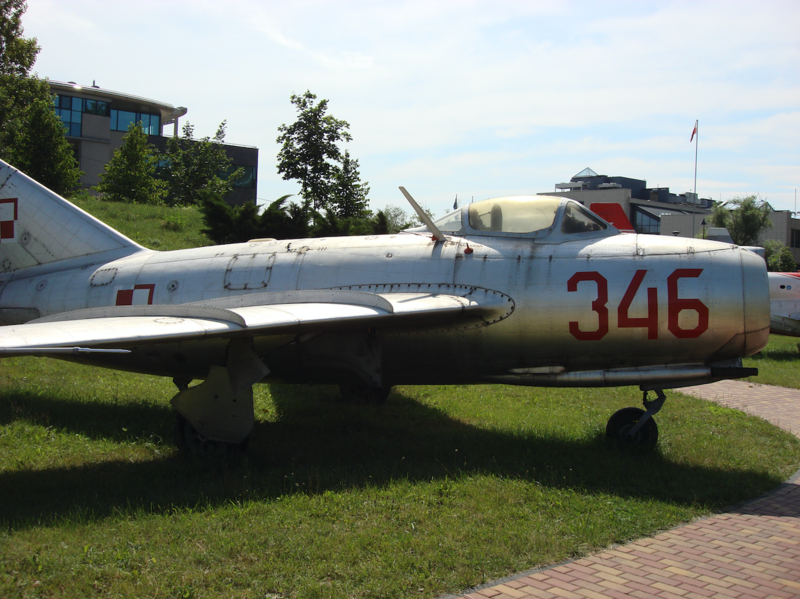 The two-seater MiG-15 UTI was only about 20 copies, and this version in Poland was not mass-produced. The fast pace of training led to the deterioration of flight safety. In April and May 1952, two disasters occurred on the MiG-15 aircraft, and in the second half of the year two more on the Jak-23 airplanes. The army's intelligence had to work properly and a training center for pilots of jet airplanes was established in Krzesiny. Gathered there part of the MiG-15 UTI aircraft. It was a partial solution to the problem. More two-seater planes were needed. We received a lot of two-seater aircraft from Czechoslovakia, produced by the local industry. In 1952 in Radom in OSL No. 5, a full cycle of training of cadet officers began. This resulted in the total independence of the aviation training process carried out in Radom from OSL 4 in Dęblin. In 1953, the school received two additional squadrons from Dęblin along with assigned airports in Podlodów and Ułęż. In the fall of 1953, it was equipped with more planes: Polish school construction - Junak-2 and the first aircraft for training on Jak-17 W and Jak-23 jet airplanes. In total, from the beginning of 1954, OSL in Radom already had 7 school squadrons - 3 for basic training and 4 for combat training - deployed at 6 airports. Also 1954 brought changes in the equipment of the basic training squadrons. A Junak-3 type school plane was introduced, and MiG-15 and Lim-1 jet aircraft received combat training squadrons. In connection with the reorganization of the flight training program and the need to create independent jet squadrons, it was necessary to introduce a new division and ordering the numbering of Radom OSL units. Squadrons training on jet airplanes received numbers from 1 to 3, so-called Transitional squadrons numbers from 4 to 6, and squadrons of basic training from 7 to 9. A major reform of the training of cadets and officers of Radom OSL occurred in 1956-1958. The fact that the army commander was the first Polish officer - general gen. pil. Jan Frey-Bielecki, who carried out a thorough change of training of military pilots. The next stage of the reorganization of flight training in Radom is the extension of the duration of education to three years. The sixth year of OSL in Radom was also a breakthrough in another respect. On September 15, 1957 the first official air show for residents of Radom was organized in Sadków. During these shows, the Radom pilots for the first time demonstrated the collective aerobatics of four MiG-15 jet planes in a flight chessboard layout. It was a ceremony connected with giving in recognition of the merits of the Officers Aviation School No. 5 in Radom, the name of Cpt. pil. Franciszka Żwirki and Eng. Stanisława Wigury. The Aviation Training Center OSL-4 in Dęblin received training in the Lim-1 type aircraft in 1957. The first subunit, which was equipped with these machines, was a school squadron, commanded by Captain J. Skwarzyński. On September 8, 1957, at the Babice-Bemowo airport on the occasion of the aviation feast, an impressive air event was organized, consisting of two blocks; demonstration of civil and military aviation skills and air parade. 260 combat machines took part in the whole event. During the show, Lim-2 aircraft were the most numerous. The introduction of modern modern fighter jets with a turbojet drive on the Polish armaments required a lot of effort from the entire Polish state. The General Staff of the Polish Army saw the need to create an Aeronautical Research Station, which would deal with the problems related to the operation of new flying equipment. The production of series Lim-1 fighters has at least doubled these problems. Under these conditions, the establishment of the Aeronautical Research Station turned out to be too modest. After long discussions conducted in the 8th Division of the General Staff of the Polish Army, a decision was made to create the Institute of Aircraft Science and Research (INBWL). The legal basis became the organizational order No. 042 / org. Minister of National Defense of June 17, 1953. The seat of the Institute has temporarily become the No. 6 hangar at the Bemowo airport. The main topic of the Institute's work has been increasing combat readiness and flight safety. The real testing ground for the Institute has been problems related to the introduction of Lim-1 fighters to the service. It was necessary to explain many new phenomena accompanying flights at perimeter speeds. The results of these works are included in the booklet Fri - "Some peculiarities in the flight of the Lim-1 aircraft", which greatly helped pilots and technical services. The engine dynamometer stands were created. In 1953, the first trials of Polish tires and brake pads for Lim-1 aircraft were carried out. In the summer of 1953, the Institute began to conduct flight tests as State Test Controls of serial Lim-1 aircraft. They have become a practical test of the developed methods and on-board and ground measuring equipment. Already on March 18, 1954, through the ordinance of the Minister of National Defense, the Institute (INBWL) receives the statute of a scientific institution. At the same time, he moves to new facilities at Księcia Janusza street in Warsaw's Koło. Lim-1 fighter planes were equipped with regiments of fighter aviation until the end of the 1950s. From 1958 to 1960, a significant part of these machines (at least 100 pieces) was rebuilt in LZR in Bydgoszcz for the SB Lim-1 training-fighting versions. Service and tragedies of Lim-1 aircraft in Poland. The first Lim-1 aircraft went to the 5th DLM, that is to 1. PLM Bemowo, 13. PLM Łęczyca, 31. PLM Łask. Another was delivered to units stationed in the north of Poland. On April 27, 1954, the first catastrophe occurred in Poland on a Lim-1 type aircraft. The aircraft belonged to 13. PLM. Probably due to the momentary loss of consciousness by the pilot performing the task in the zone, the plane hit the ground. Pilot 1 of the squadron, Lieutenant Bronisław Drobnik, died in the remains of the machine. On 28 April 1954 (ie the next day) there was a Lim-1 crash belonging to the 1st PLM Bemowo. During a flight in a circle, the pilot reported the engine went out. At the same time, he decided to make an emergency landing. But as a result of the rapid loss of speed, the plane fell in the area of ​​ul. Ulrichowska striking the house. Second Lieutenant pilot Ignacy Dobros suffered death on the spot. The third disaster occurred on July 27, 1954, as a result of the failure of the engine that failed. The pilot made the decision of an emergency landing. However, the plane was completely broken down, burying the lieutenant pilot Stanisław Bramka from 39th PLM Mierzęcice. On August 19, 1954, in the 1st PLM, the fourth disaster of Lim-1 took place. During the flight in a formation, the pilot catapulted too low and suffered death. A summary of the service of MiG-15, Lim-1 aircraft in Poland. When the aircraft was introduced to production in Poland, it was one of the most modern, if not the best, fighter in the world. When the American F-86 reached its maximum altitude during the Korean War, the MiG-15 still had a reserve of 1,200 m. However, in those years the technical progress was very large and the plane was aging quite quickly. He became enough of a good fighter, and after a few years it was outdated. However, in the Polish Military Aviation he played a special role. You can make fun of the fact that Polish Aviation has operated aircraft with the Lim-1-2 mark for so long. That pilots flew on obsolete equipment. I remember how in the 1980s young aviation enthusiasts could not get over the admiration that these machines are still flying. The reasons for this state of affairs can be divided into two groups and named them respectively negative and positive. The first basically boils down to the lack of money to buy new equipment. The latter testify to what a good plane it was. About how it was a successful and simple construction. How quickly could you recreate the combat value. It was an airplane that was easy to pilot, reliable and economical. He proved himself perfectly in assault aviation. 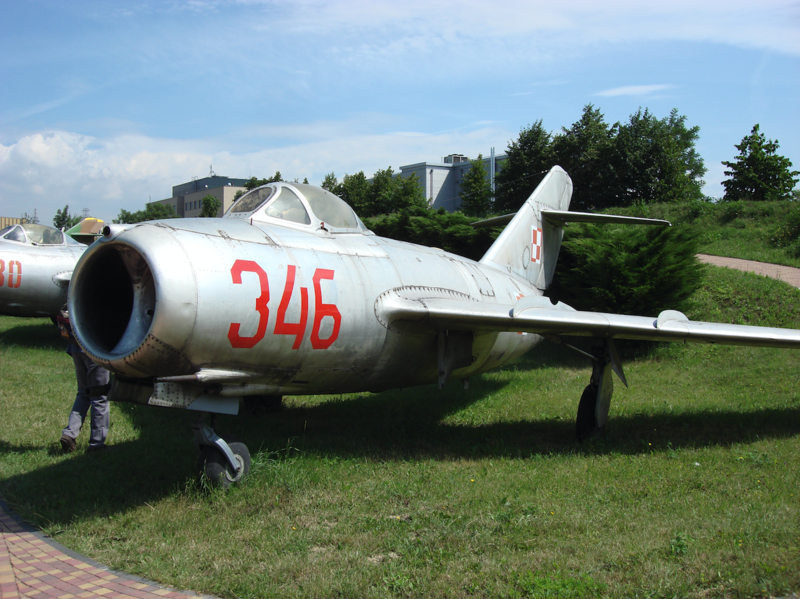 The longevity of Lim aircraft, especially in the two-seater variant, was also influenced by the lack of the school version of MiG-17 and Lim-5-6 aircraft. A huge argument, which we often do not remember, was that all production, repairs and repairs took place in the country.